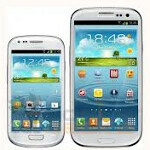 Samsung Galaxy S III mini launches in the U.K. There seems to be a trend in the mobile industry toward smaller versions of successful full-sized products. We recently saw Apple launch the Apple iPad mini which is basically a smaller version of its wildly successful tablet. You can argue that the Cupertino crew also reduced the quality of the screen, but it appears that this flaw will be corrected in the sequel model. Launching today in the U.K. is another "mini". The place where the mini skirt was said to have been born is now home to the Samsung Galaxy S III mini, a smaller version of the flagship Android smartphone that has already sold more than 30 million units. We suppose that the original's 4.8 inch screen is not for everyone and this is the main difference between Apple's intent and that of Samsung. While the Apple iPad mini exists to compete against similar tablets in its category, Sammy shrunk its most popular handset in order to get it to those who like the full-sized Samsung Galaxy S III, but can't hold it comfortably in their hand. 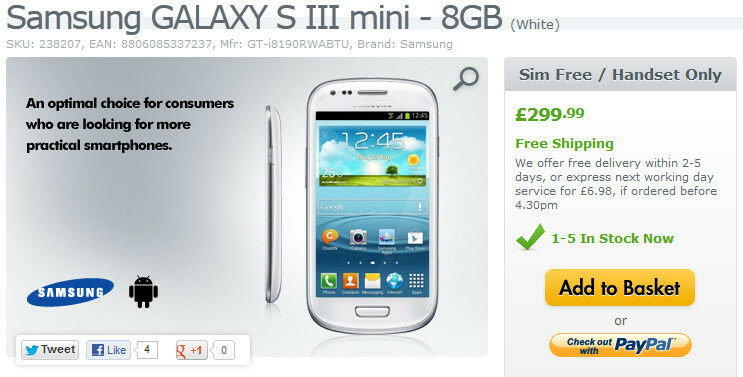 The Samsung Galaxy S III mini is now available in the U.K. The only complaint that buyers of the Samsung Galaxy S III mini would have, and it is not a "small" complaint either, is that some of the specs have been reduced as well. The 4 inch screen's WVGA resolution and 223ppi pixel density is nowhere near what is on the full-sized device and that also goes for the dual-core 1GHz processor, the 1GB of RAM and the 5MP rear facing camera to name a few. The Samsung Galaxy S III is available from online retailers Expansys and Unlocked Mobiles in the U.K., SIM-free for £299.99 ($477.25 USD) and £294.98 ($469.28 USD) respectively. It is free with a 2 year plan from £28 ($44.55 USD) per month from Three UK, or you can get the phone free with a plan costing £27 ($42.95 USD) per month from O2. The former's plan includes unlimited data while the latter is giving you only 500MB of the stuff at the listed price. Until November 16th, Three UK will have the device in stores only, not online. Phone with 2010 specs for $477. No thanks Jeff. Nice Android entry phone if it gets a good offer. no love for the u.s.?